entire species. We will, in fact, work to rebuild threatened populations through rigorous breeding programs. We will eliminate rodents, goats and cats that were unnaturally introduced to our environment and, over the years, have threatened wild life and flora. We will build oases for birds and will assure that wind turbines don't interfere with the birds' natural flight path. Everything we as humans can do to protect and reinvigorate Galapagos, we are doing with the help of organizations like the Charles Darwin Foundation, the Nature Conservancy and the Galapagos National Park Service. However, one thing that every research result tells us is that no matter how much we try to intervene and help, humans cannot prevent the inevitability of evolution. Nature is always changing; currents are shifting the ocean; tectonic plates are shifting the land. Wind and the elements are causing land erosion. Volcanoes erupt. Preserving the islands as Darwin and others first experienced them is an impossible task. In one recent publication it was determined that rising and falling sea levels have contributed to the the distribution of fauna across the different islands. This new study suggests that as the levels of the Pacific Ocean changed over millenia the islands themselves connected and then separated again. During the periods of low water levels, when the islands became one large land mass, animals like snakes and lizard were able to migrate from one area to the next just by crawling across. Likewise, plants were able to pollinate and germinate across distinct island masses. Then, when the waters rose, even though the individual islands became isolated once again, the same species could be found in more than one area. Because this mechanism can only have affected a small number of other oceanic island systems around the world, "the Galapagos Islands are more special than was previously thought," said a study coauthor. So, in Galapagos we have two distinct and equally important evolutionary changes: Darwin's established theory of natural selection and adaptation to the individual island environments as well as distribution of species across islands. 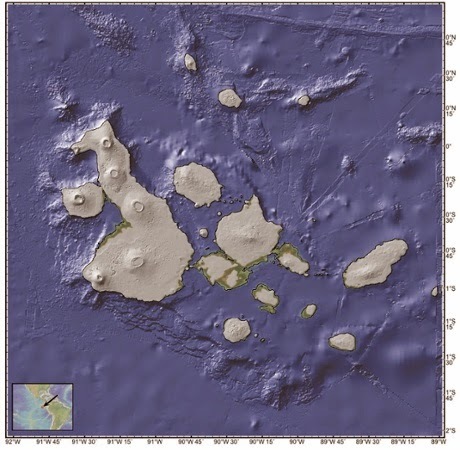 One other finding of note: "the new model can explain a striking pattern seen in the distribution of species across the Galapagos Islands: on the outer islands, a species will typically be found on only one island, but on the central, or core, islands, a species usually is present on all of the islands. This pattern is most apparent in the distribution of the Galapagos' racer snakes, lava lizards, land iguanas and geckos. 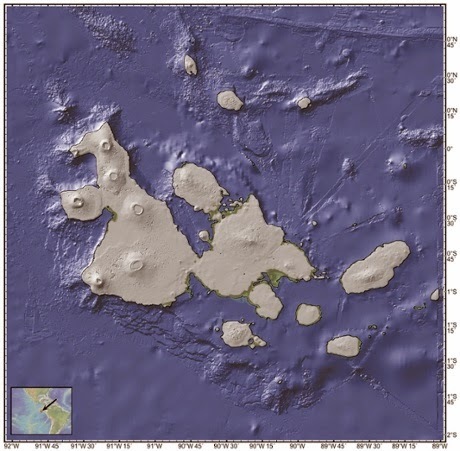 These images illustrate graphically some of the changes in the island masses that have occurred in less than 1 millions years. The Galapagos at 630,000 years ago. Snakes could have crawled between what Charles Darwin saw as islands “about 50 or 60 miles apart.” Reproduced from the Journal of Biogeography via John Wiley & Sons. 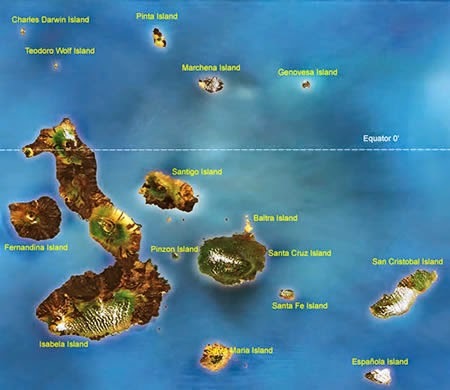 The Galapagos at 20,000 years ago. You could practically skip from island to island. Reproduced from the Journal of Biogeography via John Wiley & Sons. 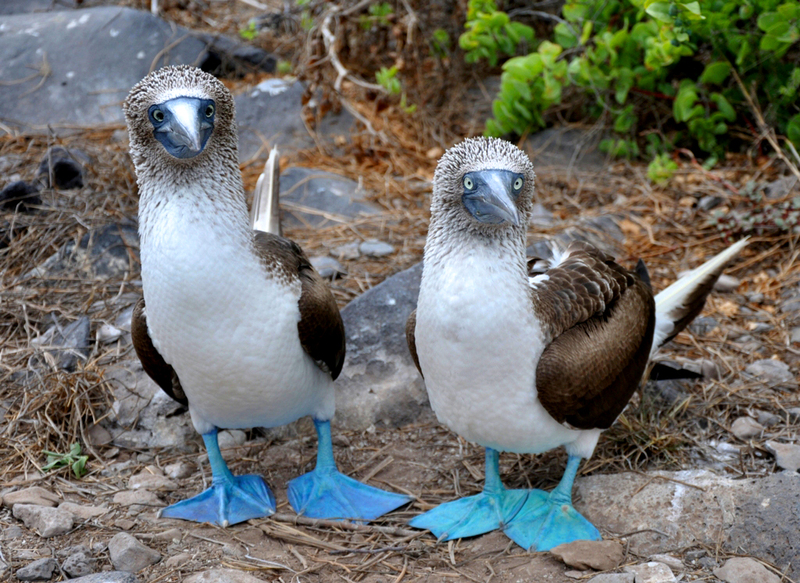 In another significant study just published by Scientific American, scientists proclaimed that the Blue Footed Boobie population is becoming at risk and that the Red Footed and Nazca Boobie populations may be following suit. According to the study, the Galapagos Islands have seen a population drop of more than 50 percent over the past two decades. A series of surveys from 2011 to 2013 found only 134 fledgling birds in an area that less than 20 years ago would have held hundreds if not thousands of nests. Researchers estimate their current population at about 6,400 birds, just half of the last estimate from the 1960s. It is believed that the change is the result of the reduction in the number of sardines, the boobies' primary food source, that may be the result of overfishing or climate change. Many questions remain: Why is this happening? What impact will the reduction of boobies, and therefore less guano, have on the flora? Will boobies move somewhere else? Will they adapt and start having multiple births to increase the population base? What of the diet of the Galapagos hawk? If there are fewer sardines and other small fish, how is this effecting the diet of sea lions and other marine live that rely on them for sustenance? Research is ongoing. We cannot control nature. 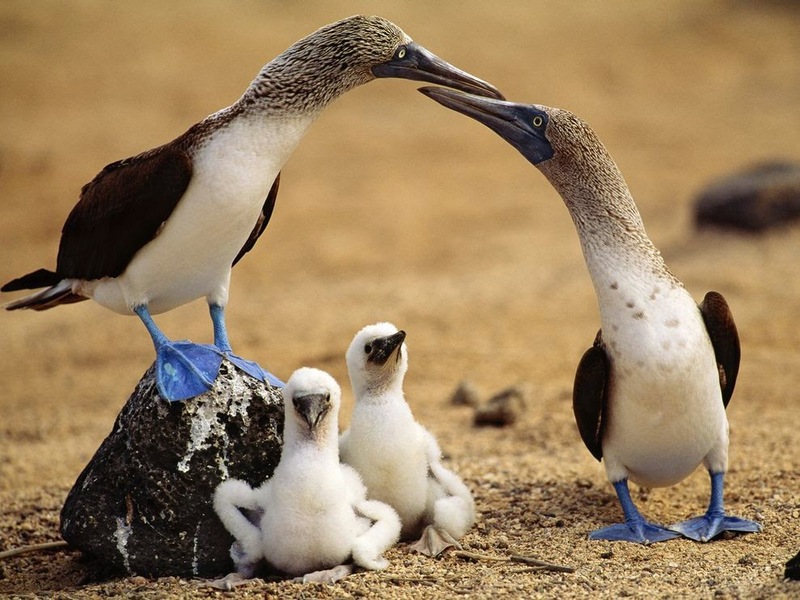 We cannot control what happens to the small fish on which the Galapagos Blue Footed Boobies rely as their primary diet. And, most certainly, we have no way to anticipate, let alone have any impact on, when the Pacific Ocean will rise and fall, change temperature or even when El Nino will return. Yet, these are the very occurrences that scientists predict will impact the future of the Galapagos Islands. It's how we intervene with our knowledge, technology and experience that will change the impact nature's course otherwise might have. I'll keep you informed in these pages about research. For me, the results are both frightening and hopeful. Frightening because I hate the thought of some of the inevitable changes; hopeful because by predicting, we may be able to intervene and help maintain the status quo and even built some of what already has been lost.